The long, thick lines and smooth, aerodynamic curves of the 1949 Hudson Super Six make it a stunning car to turn into a lead sled, as evidenced by the elegant, sledded-out museum piece shown below. The 1949 Hudson Super Six was released as a full sized luxury notchback coupe, with (according to Automobile-Catalog) a naturally-aspirated 4-stroke Six-262 engine. 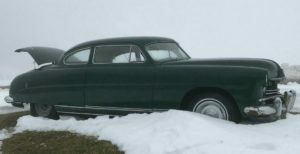 This 1949 Hudson Super Six runs but the ‘surface needs work; according to the seller, and it is a one-owner, museum-owned vehicle, and it has undergone a few pretty cool modifications. Let’s visit the interior first since that’s a comfort detail for whoever buys this beauty – the interior has been reupholstered, and from what is visible in the photos, it looks pretty nice. One last feature I would like to point out on this Hudson Super Six is on the front end – recessed, Frenched headlights that add to smooth, clean lines of this amazing 1949 custom car. If you would like to learn more about this ’49 Hudson led sled, which is for sale, as of the posting of this article, click on the photo and it will take you right to the listing, or browse around this site to read about some other beautiful classic cars. Classic Cars Online US is honored to partner with Izea and eBay to bring you information on the 1949 Hudson Super Six.